Turn any full-range passive or powered monitor speaker or sound system into a dynamic guitar cabinet, loaded with your choice of drivers. No mics, power amps, guitar cabinets needed. Just take your guitar signal from your pedal board, preamp or power amp and send it to the house sound console or board or powered full-range cabinet. The GCS-5 doubles the tonal capabilities of its predecessors by adding an AMERICAN / BRITISH speaker type selector switch. The GCS-5 replaces the physical combination of speakers, cabinets and microphones used in live performance and recording with a consistent and “real world” simulation in a small steel enclosure. The GCS-5 features a unique set of unconventional filters tuned to simulate the acoustic resonances and frequency responses of mic’d guitar speaker cabinets. The GCS-5 is inserted between the output of your preamplifier, power amp or pedal board and a recording interface or PA system. The GCS-5 includes a LEVEL control with an LED monitoring meter to optimise performance. The XLR OUTPUT is compatible with phantom power, and a 20dB PAD allows for direct connection to power amp outputs. The HEADPHONE OUTPUT with a separate LEVEL control is provided for private monitoring and practice. The GCS-5 puts the guitar player back in control and gives them the opportunity to keep "their tone" consistent from gig to gig as well as in the studio. The ADA GCS-5 is inserted between the output of your preamplifier (or effects pedal chain) and a mixing or recording console to replace the close proximity microphone that is typically used to mic a guitar speaker cabinet. This eliminates the problem of bleed through or crosstalk from other instruments or amplifiers in live situations. GCS-5 is especially useful for owners of our APP-1 guitar pedal preamp because it can split the output of the APP-1 for sending the signal to a guitar amplifier and to a mixing console for recording, house sound systems and stage monitor systems. 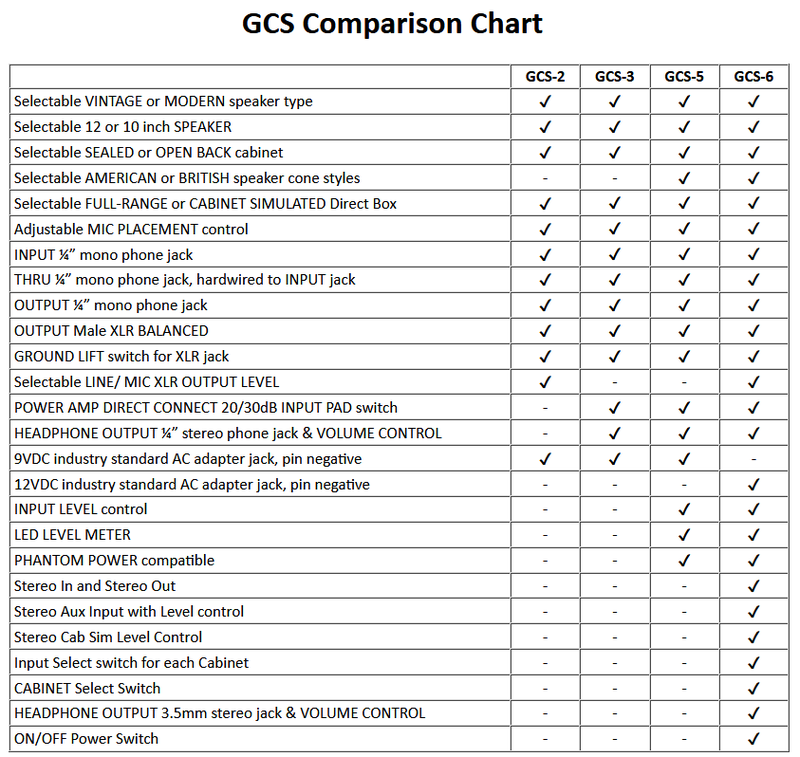 The GCS-5 is ideally suited for live performance, studio, and practice applications. A unique feature of the GCS-5 is that it replicates the low frequency natural resonance of a guitar speaker cabinet at loud volumes, which is especially noticeable in the SEALED CABINET configuration. Select from vintage or modern, 10 or 12 inch speakers in a sealed or open back cabinet to get the powerful and rich resonance of a real guitar cabinet, and then dial-in the position of your microphone to balance it out. We have tested the GCS-5 in live performances by sending a feed to a stage monitor for the guitarist and eliminating the combo or head with stack. The same feedback that you get from a stack or a hot-rod combo can easily be produced in the monitor, and interestingly, with more control.